It takes 500 sparkling costumes, 200 hats, 100 wigs, 150 pairs of shoes and mountains of mascara to achieve each live show of Priscilla, Queen of the Desert. Now I've seen it, I can see why. 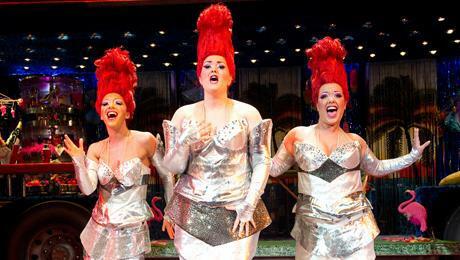 This fun, loud musical is a complete sensory overload. It's a party from the moment the curtain goes up at Birmingham's Alexandra Theatre. It starts off with 'It's Raining Men' and finishes on 'I Will Survive'. Everything in-between is a camp pop classic. 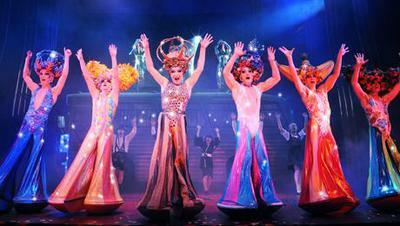 The fantastic costumes are so flamboyant that you can't wait to see what they will appear in next. By the time the dancers come out dressed as glittering cupcakes and even huge pink paintbrushes, I don't bat an eyelid. This heart-warming story follows three larger-than life characters on their adventures finding love, friendship and even fatherhood as they travel from Sydney to Alice Springs for a show. Translated from the award-winning Australian film of the same name, this production features exactly the same script and jokes, which can be a drawback as fans of the movie can find them constantly comparing the two and knowing what to expect. But there are a couple of extra quips thrown in, like when former Neighbours star Jason Donovan - headlining as drag queen Tick - manages to keep a straight face during a conversation about how wonderful his real-life ex-love and colleague Kylie Minogue is, adding "I always fancied Scott Robinson myself" (the part he used to play in the soap opera). To the credit of Donovan, and another Australian soap star, Richard Grieve (Sam Kratz in Neighbours and Dr Lachlan Frazer in Home and Away) as ageing transvestite Bernadette, they both manage to completely transform themselves into the feminine roles so they are barely recognisable. Their third amigo on the journey across Australia (in a bus, named Priscilla) is Felicia played by Graham Weaver, who won over the audience with his extrovert character. Then there are three singing "divas" - Emma Kingston, Ellie Leah and Laura Mansell - who provide a fair bit of the singing while floating above the stage as angels and the like and have excellent voices. But as tender as the story is at times, this show is never going to be about the drama. It's about the drama queens. Music, laughs, smutty one-liners and embracing the diverse and free-spirited, this show appeals to all kinds of people and attracts a varied audience from groups of women and middle-aged couples to gay men. It is simply a feel-good fun night out packed with uplifting music from start to end. This show is not suitable for children as it has explicit content and language.